If you have been an avid follower of this website for quite some time, you’d know that we as a site always like to predict, and when it’s time for WOW Hits to release their compilations every year, we think about what would be included on the annual Christian music compilation. While these days now it seems that the WOW Hits brand may be a bit redundant, every year it’s still half the fun guessing which songs make the cut and which songs meet the cut. Because there is only space for 39 songs on each WOW Hits (maybe even less on previous years, especially in the 2000’s when there weren’t any bonus deluxe editions! ), it’s understandable when certain hit songs are omitted for whatever reason. After 2011 (WOW Hits 2012), DVD’s suddenly stopped production, hence, this post right here. I have since decided to predict what would’ve been WOW Hits 2014 DVD if it were actually made, as well as predict WOW Hits 2014 CD, if it were actually songs that were timely and a variety of different artists, rather than the same selected few all the time. NOTE- these lists for both WOW Hits 2014 CD and WOW Hits 2014 DVD are not the official track listing; there is no official track listing (for the DVD), these lists are just what could’ve and should’ve been, taking into account all the music videos and radio singles released around 2012/13. 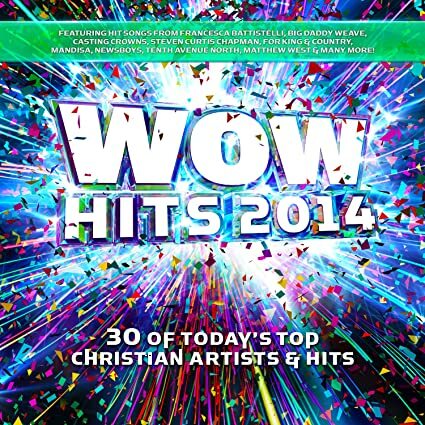 What do you think of my version of WOW Hits 2014 DVD (39 tracks in total!) and my ideal version of WOW Hits 2014 CD? Til next time. Previous PostSwitchfoot & Lifehouse – Shine Like Gold (Single)Next PostFLASHBACK FRIDAYS: WEEK 27 (The Story Of Your Life by Matthew West)- Why Your Story (And Your Story as part of His Story!) is the most important thing in the whole world! You know, I’ve been looking at the Christian Airplay charts and I did not find “All In (Apologize)” on one of them, meaning that it wasn’t really popular, which is probably why it wasn’t on WOW Hits 2014.